Halloumi is a deliciously lush cheese which is usually eaten fried until golden. Like most cheeses, it is high in protein and fats and low in carbohydrates, making it suitable for keto or low carb eating. 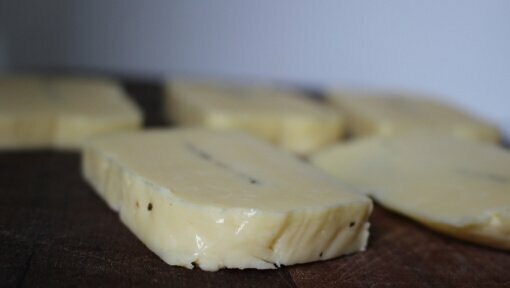 Cheese also contains high amounts of calcium and B12. Halloumi has a slightly higher fat content than a standard cheddar cheese, and this makes it very satiating. A little goes a long way and it can feel like a real treat. 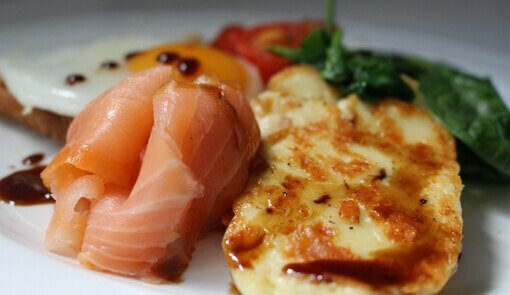 What also makes halloumi cheese keto friendly, is its texture and versatility. Halloumi is great cooked simply, thrown into salads, grated, or can be a handy meat or bread substitute in a whole range of dishes. 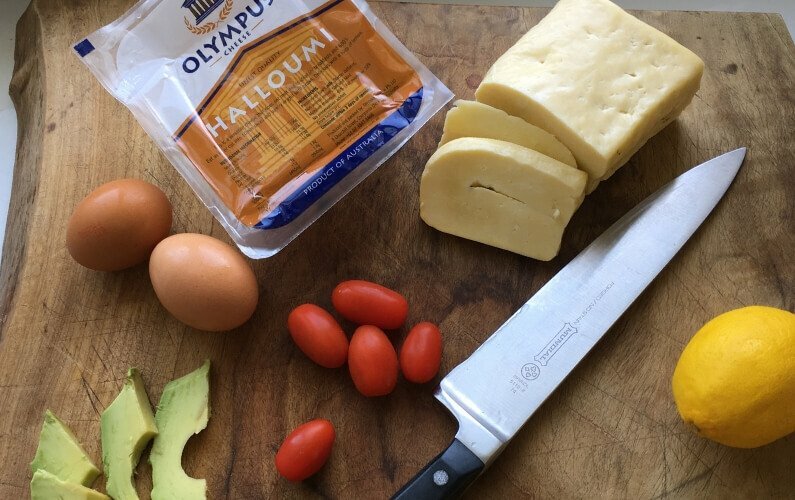 Find out how many uses halloumi has for your low carb meals. Deliciously golden halloumi alongside mushroom, fried eggs, tomato, wilted spinach and smoked salmon is a wonderful weekend breakfast. You could also add slices of lush avocado for more good fats. Our recent article 5 Better Breakfasts with Olympus Cheese and Yoghurt gives you the recipe. While we’re on the breakfast tip (or lunch or dinner) let’s mention a brilliant keto meal idea – shakshuka. Many people use a fetta cheese – which is equally wonderful. 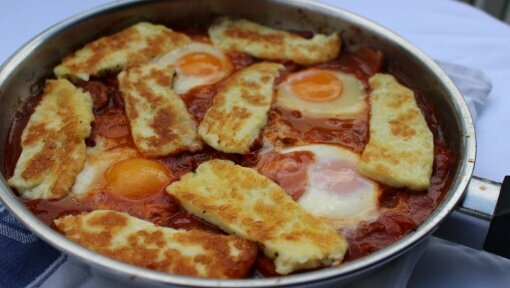 But we recently made a halloumi shakshuka version, and we think you’ll love it! To modify it for keto, simply omit the sugar and chopped capsicum. The flavours will still be lovely. Halloumi’s full texture means it can be sliced thickly and used as ‘bread.’ Trying making a lush bruschetta that will please your low carb diet, and your guests. Or you could use it to make a delicious vegetable stack. 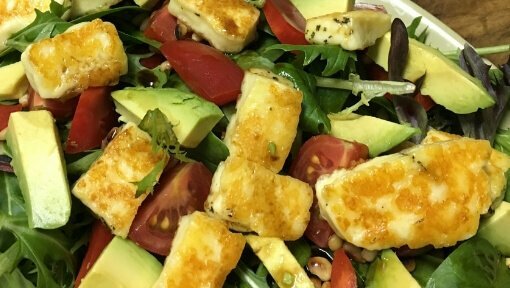 Golden cubes of halloumi can jazz up any salad into something substantial and exciting. For every day simplicity, you can grill some in a flash and add to a lovely green leaf salad with avocado, tomato and toasted nuts. Or for something more extravagant, try this recipe for Roasted Cauliflower and Halloumi Salad, which incorporates halloumi with sumac-roasted cauliflower and basil. A delightfully tangy lemon and caper dressing takes the whole thing to the next level. One thing you may miss about the keto diet is bread style products. 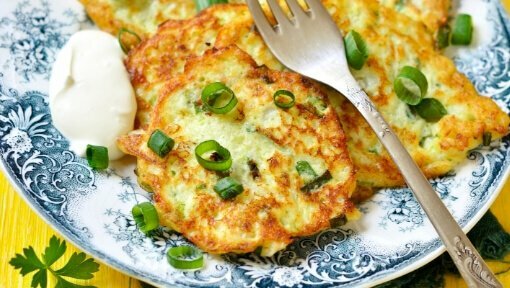 That’s why Eat Drink Paleo’s super little recipe for Cauliflower and Halloumi fritters might be a welcome change. 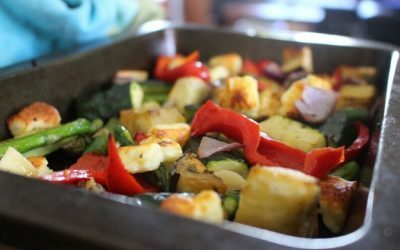 They contain lots of wonderful vegies, grated halloumi and the addition of coconut flour to bind. A good piece of fish or meat and a side salad or grilled veg are always made better with the squishy deliciousness of halloumi. For a winter warmer, you can top a thick soup, or slice and bake into the most delicious bakes. You can also grate it and stuff a portabella mushroom with a few herbs and even some bacon. 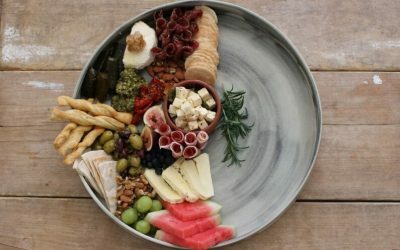 If you’re in Brisbane like us, and would like to know more about the practicalities of keto, Chef Dominique Rizzo holds Keto Workshops through her cooking school and restaurant Putia Pure Food Kitchen. 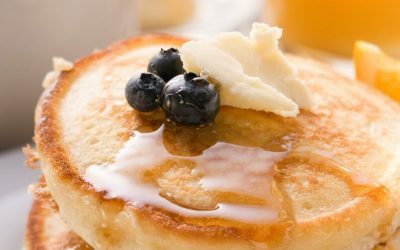 Try these 3 delicious ricotta pancakes for Pancake Day! Try low carb lemon, buttermilk and dark chocolate ricotta pancakes with creamy Olympus Ricotta.